I planned ahead this week in order to join Cathy with In A Vase On Monday. Though this is an opportunity to share an arrangement using materials collected from the garden, for today I assembled a design on Friday using remnants of packaged bouquets I was given. There were two bouquets actually and I arranged deep red Gerbera daisies from one along with branches of gardenia foliage from the garden for a full and richly colored vase. Additional yellow and orange gerberas from the second bouquet added light and movement, but you have to take my word for it. Before I could photograph them the next day the daises had wilted and drooped leaving behind a couple of bright yellow spray mums to carry on alone. It was disappointing to lose the gerberas but feeling over-saturated anyway from all the red of holiday decorations and from my own heavy reliance recently on red Camellia sasanqua ‘Yuletide’ in Monday vases, the forced shift in color is welcome. There were more Yuletide blossoms available, but I find today’s yellow palette crisp and refreshing for a winter’s day. Selections of Eucalyptus leaves and bear grass trimmings taken from the florist packages emphasize shape and line. 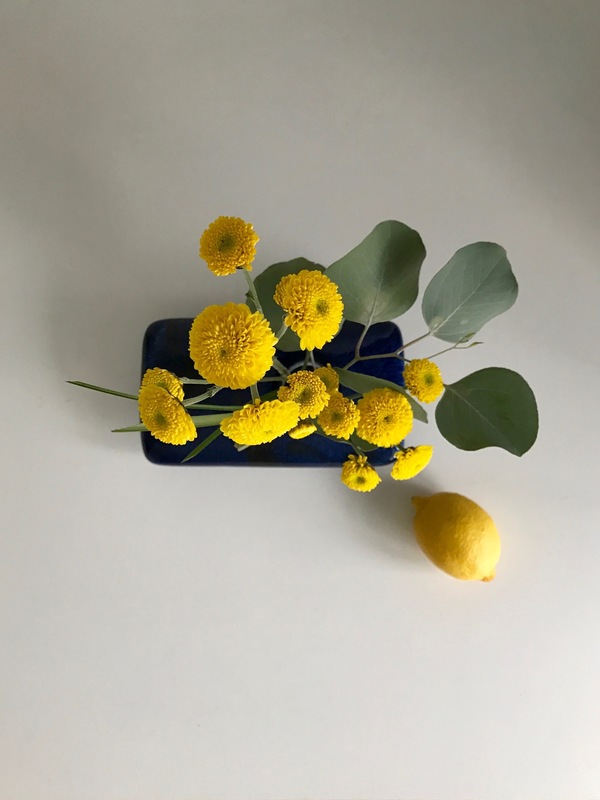 A lemon reinforces the color. This entry was posted in garden and tagged 2017vase, Camellia sasanqua 'Yuletide', chrysanthemum, Eucalyptus, flower arranging, flower design, in a vase on monday, nature photography on January 9, 2017 by pbmgarden. Again, so elegant Susie! I am going to have to try to learn how to create these designs I admire them so much. You should give it a try. As usual, mine didn’t turn out as expected from the picture in my mind’s eye, but the yellow’s cheeriness was rewarding. Marian, it’s just 9 degrees at 8 a.m. Glad spring is just around the corner. We are out of the single digits for a while. It’s 18 degrees at the moment (though feels colder). That is a perfect January arrangement: fresh and bright. Makes me smile to look at it. Makes me smile too Linda. Here’s to warmer days. Beautiful and artisctic, as always Susie. And well done on 6 years blogging – what a new world it opens up! Thanks Cathy. And you’re right, blogging does open a new world. Very rewarding and interesting. Simple and indeed refreshing! I think the Bear Grass is my favorite element. Thanks. The bear grass was a little past its prime so I trimmed it and used the leftovers. I like it best when it’s long and curves naturally–adds a little dance to any design. I like the grassy loops in the Ikebana style arrangements. 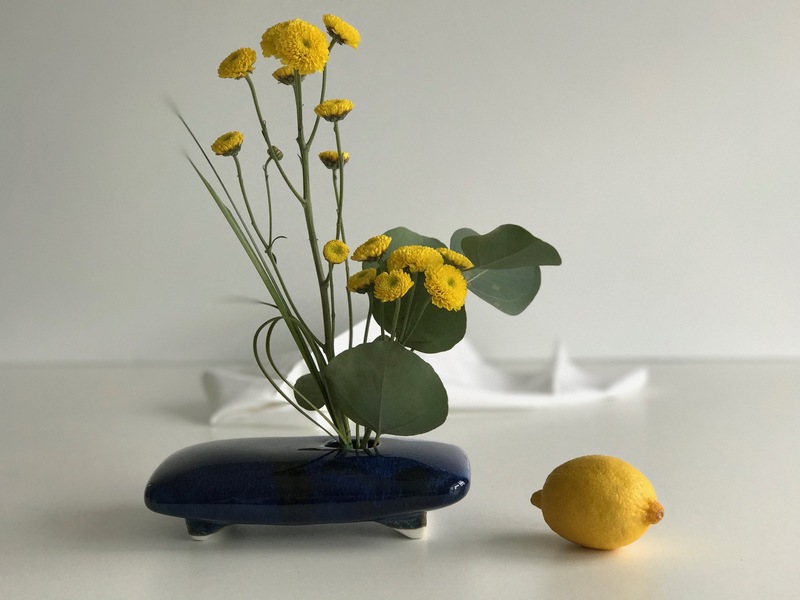 Your arrangements often have that element of ikebana about them. 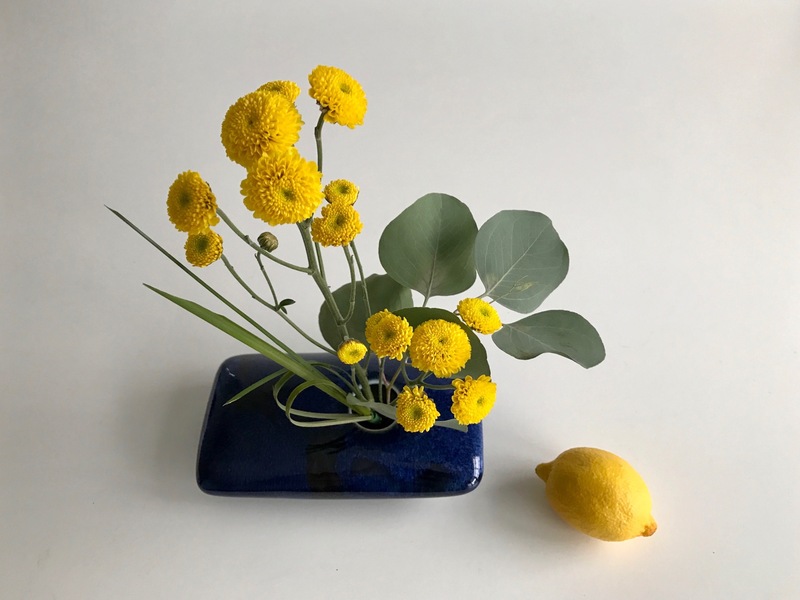 To do simplicity well is a skill, i love this arrangement, the placing of the lemon just adds another dimension to it. Thanks for the kind comments Brian. 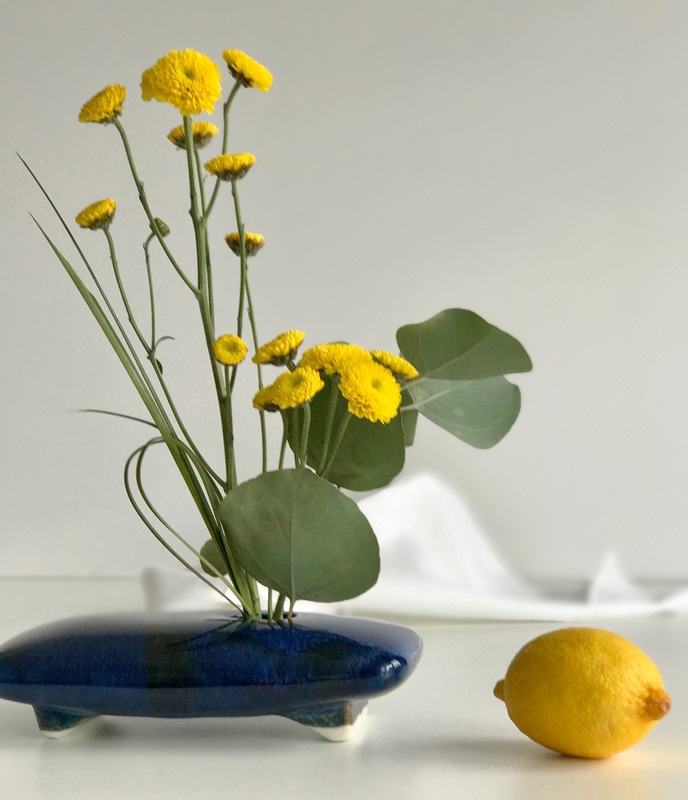 I’ve had a dozen lemons in a bowl during the holidays and it just seemed appropriate to reach for one to go along with this vase. Gorgeous – you are right fresh and a bit zingy after all that Christmas red. Thank you Ann. I’ll be ready for red again soon no doubt. Very nice – I love the design, Susie. I went to a Japanese block print exhibit at the Clark Institute yesterday and there was a lovely book on Ikebana in the museum shop. Made me want to attempt an arrangement or two! The print show sounds nice. I’m not familiar with Clark but will check it out. I don’t pretend to know the rules of Ikebana but have seen several demonstrations and find I do find it fascinating. If you have a little pin holder it makes the work go more easily. Thanks Cathy, the blue vase is one of those purchases I do not regret. It’s so versatile. Yes, spring is in my mind too. We’ll have 70 degrees F. (21 C.) in a couple of days! Beautiful, crisp and clean as usual. That overhead shot is perfect! Thank you. The overhead view was a surprise–wish I had actually designed it that way. I’m sorry you lost the gerberas but the simplicity of the yellow mums with the Eucalyptus foliage is appealing. I love the lemon as accent too. Thanks Kris. That gray-green of eucalyptus is a color I favor–seems to work with every color. I rarely have gerberas since I’ve not had any luck growing them and rarely buy cut flowers. The red was a rich wine color that was just sumptuous, but the yellow worked out too. 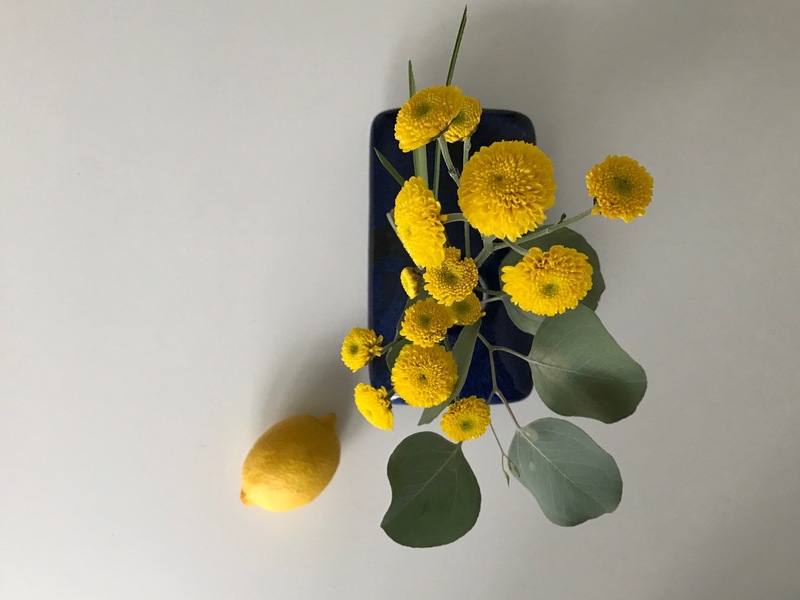 Yellow is the perfect antidote to all the red and green of the last few weeks. Well done! Thanks Ricki, this yellow may tide us over until daffodils and other spring yellows can brighten our days. Funny how personal our color preferences can be. Glad it made you think of sunshine. Have a happy week Annette. A lovely bit of sunshine here. I love the bowl and your Ikebana style. It is difficult to pull off but you are brilliant at it. Lovely. Thank you. Having a good foundational vase like this one gets one most of the way there. Purchased it last summer and enjoy using it. You are an artist, Susie! Anca, you’re so kind. Thanks. Love the design! The vase itself is beautiful, shape and colour. It would be modest for midsummer, but for this time of year it is outstanding. Great container. Joanna, midsummer is such a rich, lush time isn’t it? So simple and elegant, very nice.